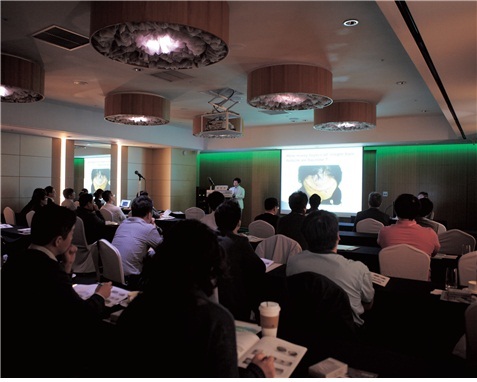 This time we will discuss the density and depth of transplantation in depth. There are many ways to calculate the area of hair loss. Personally I don’t use this method, but one of them is introduced by a chinese american named Steven Chang, who used plastic wrap to mark the area of hair loss and placed the plastic wrap on a graph paper (Figure 1), to count the number of cells (1㎠ per cell) covered by the marking on the plastic wrap. The area can be calculated roughly by counting cells, not covered entirely by the plastic wrap, as half cells. Once you get a rough estimation of the area to be transplanted and the density of transplantation, you can calculate the approximate number of hair FU required for the transplantation, which is the basis of determining donor site. <Figure 2> shows relatively safe donor area. 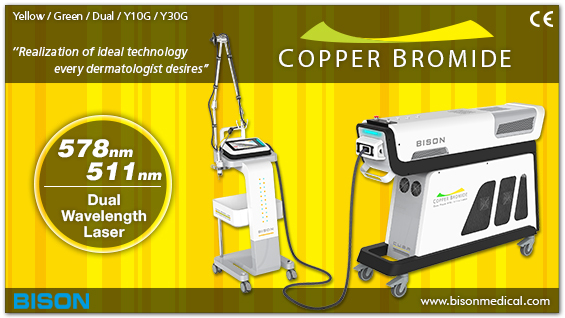 Problem occurs often when there is not enough donor area for safe harvesting of hair. The number of hair strands available from the donor area is limited, and you need to consider how to transplant those limited number of hair. You need to calculate, in advance, the area of transplantation that may preclude intended density. There have been a lot of studies around the world on the degree of density control. Dr. Lee Seok-jong, the professor of Dermatology in Kyungpook National University Hospital, conducted the study involving Koreans, and found the results as summarized in <Table 1>. As you can see in <Table 1>, increase in density also changes the survival rate. The length of hair follicle is very different between westerners and Koreans, as is the incision depth, precluding the survival rates published in western countries from being applied to Koreans. Hair thickness is also different; if the area is the same, greater number of hair strands can be transplanted and the incision depth can be made shallower among westerners. On the contrary, Koreans may have different survival rate, because thicker hair should be transplanted more deeply. In terms of cosmetics, 20 hair FU/㎠ density can achieve the highest survival rate among Koreans. I personally tend to lower the density to less than 20 hair FU/㎠. 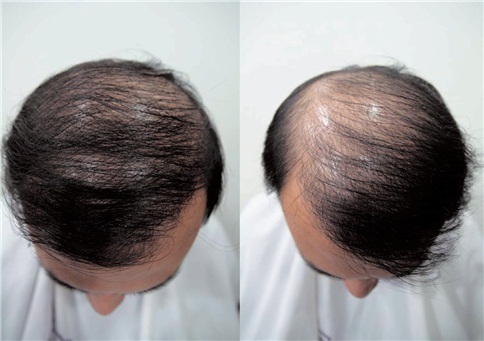 Asians like Koreans often have limited hair available at the donor area, especially those with a wide hair loss area, as much as corresponding to Norwood-Hamilton scale V-VI. In this case, various methods should be considered to make the most out of those limited hair. One of the methods I use is to plant more hair on one side, considering to part the hair later. 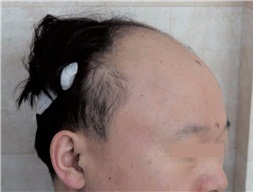 This patient in <Figure 3> had slightly more hair transplanted on the right side and then the hair was parted on the left afterward. Parting the hair on the other side would reveal more sparse hair, which may raise complaints from patients. Some patients even complain about the result after parting their hair in the middle, which is just the same as having only half of the 3,000 transplanted hairs. Thus, patients should be fully described in advance about having to select a side for parting hair. I personally determine the density of hair as the number of hair FU per ㎠, but 2-hair FU or 3-hair FU can be transplanted on the area requiring more density and then 1-hair FU on the other side. Transplanting multi-hair FU can provide the same effect as transplanting much hair, even if the density is not very high. Figure 3. Left side shows parting the hair on the intended side, and right side parting the hair on the other side. Transplanting more hair on the side to part the hair and less hair on the other side (density gradient) can yield the maximum effect. I do not recommend temporal peak to my patients, and there are 2 reasons. First, patients with severe hair loss do not have enough hair for the top, let alone the temporal peak. Second, patients often experience temporal hair recess after having transplantation at the temporal peak, This leaves hair that looks like a peninsula, requiring another hair transplantation. This problem arises due to the lack of donor area, but it’s not to say to leave out the temporal peak. 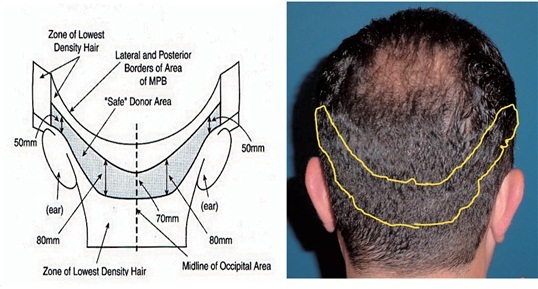 If the hair loss is too severe at the temporal peak, then a minimum amount of hair can be transplanted at the expense of the amount of hair to be transplanted in other areas of hair loss (Figure 4).